We would like to express our biggest thanks to all participating children and parents. Thank you for taking time to complete the drawing and making this contest a success. Stay tuned to our website and Facebook for future contests. Check out the winning artworks here. Whip out your colour pencils and bring on your creative side this school holidays! Join us in our Sing Chu Children Colouring Contest 2016 – I Love Stories Series 1 and you will stand to win attractive prizes. The Giant’s Garden has lost its colours and we need your help to fill it back. 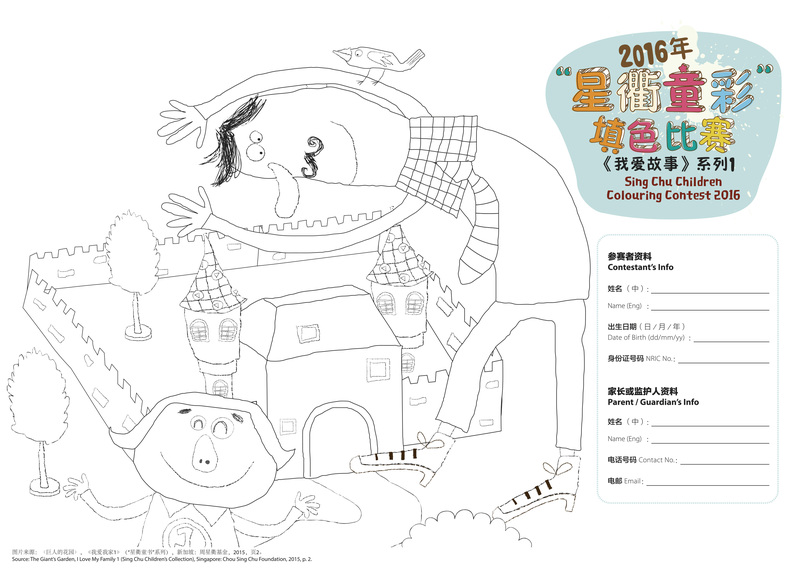 Simply download and print the contest form and complete the drawing with brilliant colours. You can use colour pencils, watercolour, poster colours, crayons or even magic pens! The contest is opened to children 6 – 10 years old, Singaporeans and Singapore Permanent Residents, and limited to one entry per contestant. Closing date: Entries to be received before 26 June 2016 (Sunday). *Scanned entry must be at least resolution of 300 dpi and complete. Please click the image to download the contest form. • Print out the colouring sheet from our website: http://www.chouscfoundation.org. • Scanned entries must be clear (resolution of at least 300 dpi) and complete (please make sure the edges are not cut off ). • All entries must be accompanied with a completed contest form. Incomplete forms will be disqualified. • Entries must be received before 26 Jun 2016, 23:59. • Winners will be announced on our Facebook (http://www.facebook.com/CSCFSingapore) and Website (http://www.chouscfoundation.org) on 1 July 2016. • Winners will be notified by email, phone or postal mail. 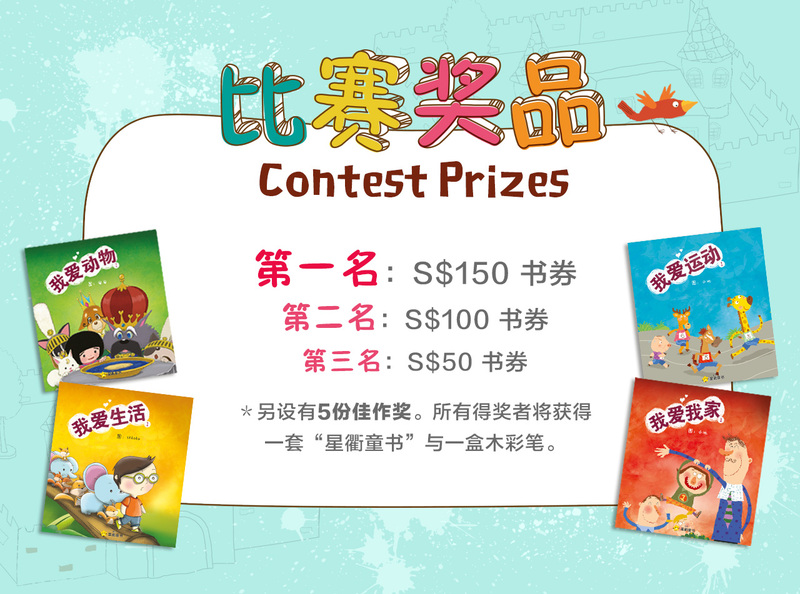 • Contest is open to children 6 -10 years old, and must be Singaporeans or Singapore Permanent Residents. • Contestant is limited to 1 entry per child. • Please encourage child to complete the colouring page without parental or guardian assistance. • Picture may be coloured with, but not limited to, crayon, colour pencil, marker or paint. Digital colours will be disqualified. • Submission by postal mail to be strictly in A4 size. • By entering the Contest, all entrants agree to be bound by the terms and conditions of the contest. • Chou Sing Chu Foundation (CSCF) reserves the right to disqualify any Contestant’s entry in the event of any Contestant’s failure to comply with the contest’s terms and conditions. • By entering this contest, contestants and their parent(s)/guardian(s) consent to CSCF’s publishing or announcing any Prize winners’ name and photograph(s), without seeking further permission or providing compensation to the Contestant or any other party. This shall include unlimited reproduction, publication, use and distribution in all forms and media, and in all manners including, but not limited to, advertising, trade, display, editorial, art, video production, exhibitions and website content. • CSCF and all parties associated with this Contest are not liable for any cost of entering the contest, loss of submissions through postage mail and the cost of the redemption of any Prize. • All decisions made by CSCF with respect to this contest are final. CSCF will not enter into correspondence with any Contestant with regards to the contest’s results. • This contest is not associated with, nor is sponsored, endorsed or administered by, Facebook, Inc.